Check out these round wood bar tops with natural corks! 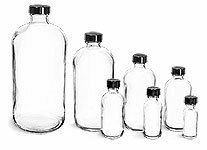 They fit perfectly with our clear glass bar top bottle, but could also be used with a variety of syrup, oil or liquor bottles. Order these cork stoppers in cases of 1,000 or bags of 24.